Sierra Adventures is Reno / Lake Tahoe's most trusted & experienced outfitter. Offering single-day trips, multi-day trips, and adventure combos. Choose your dream adventure, and LETS GO! Click HERE to pay your deposit and reserve your adventure. Sierra Adventures takes care of the details, you have fun! All adventurers require a 50% activity deposit. The whole family will enjoy snowshoeing with Sierra Adventures. Intro: Winter adventures with altitude and attitude, each option is designed for intermediate to advanced participants. Explore some of the best backcountry in California and Nevada on snowshoes. This is a wonderful adventure where you set your own pace. The Tour: Your snow adventure begins with a pickup at any local hotel. We will help your group with any rental needs, then shuttle you to your start point. You will enjoy the peaceful winter wonderland as you hike along the scenic trails. You'll have the opportunity to enjoy the breathtaking views of north Lake Tahoe's snowscape, and possibly viewing wildlife and the tracks they have left behind. 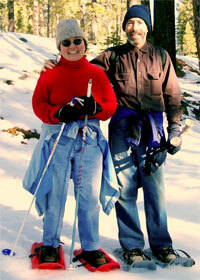 Snowshoeing can be combined with other activities through advanced booking.